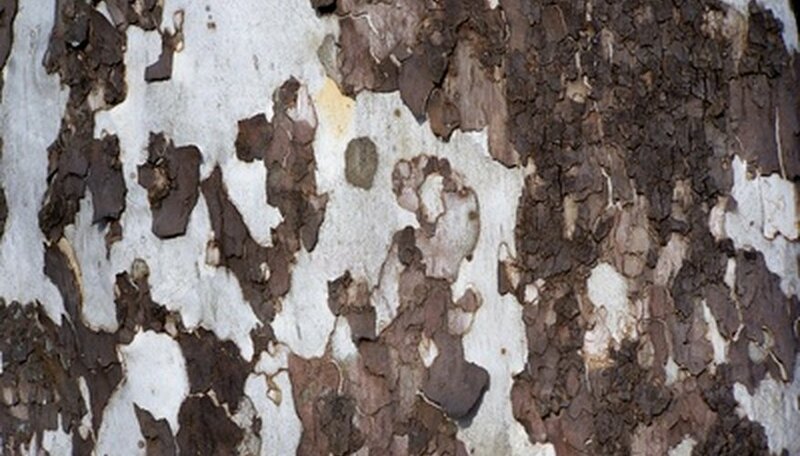 Sycamore trees are best known for their mottled, peeling bark. The bark is typically greenish-white or grayish-green in color for a visually interesting look to the landscape. Sycamore trees grow tall, reaching heights of 90 feet. Some sycamore trees have small limbs that look whitewashed to contrast with their bright green leaves. The leaves on the sycamore tree are 3 or 5 lobed and begin to fall in the summer months. The American sycamore is a deciduous tree with a medium to rapid growth rate and coarse texture. The trunk on the American sycamore is massive and the crown is wide spreading with crooked branches. The bark is mottled with white and gray for an unusual color pattern. The American sycamore tree grows a towering 70 to 100 feet tall and 60 to 80 feet wide, creating a commanding presence in the landscape. The green leaves are 4 to 9 inches long and turn a tannish brown in fall. The globose shaped fruit are 3 to 6 inches wide. The American sycamore requires full sun to partial shade and well-drained, moist soils. It thrives in USDA hardiness zones 4 to 9. The sycamore maple is a deciduous sycamore variety with a medium texture. The upright spreading branches are dense and compact. The sycamore maple tree grows 40 to 60 feet tall with an oval to rounded shape. The dark green, thick, leatherlike leaves grow 3 to 6 inches wide and are tinged with white on the underside. The flowers on the sycamore maple are yellowish green in color and emerge in May. The pendulous-shaped fruits grow in clusters up to 2 inches wide. The scaly, flaking bark on the sycamore maple is gray and tinged with orange. Sycamore maples require full sun to light shade to thrive. They are easily established and can tolerate acidic soils, making these trees versatile. They grow in USDA hardiness zones 4 to 5. The Arizona sycamore tree is a deciduous tree with a slow growth rate. In early spring, the yellow flowers emerge to last into the fall. The Arizona sycamore grows up to 80 feet when mature. The peeling bark is dark gray with a greenish layer beneath. The vibrant green leaves are 3 lobed. Arizona sycamore trees require full sun and well-drained, moist soils. This variety of sycamore is drought tolerant and ideal for arid climates where temperatures are high and rainfall is low. The USDA hardiness zone for planting is 7 to 9.